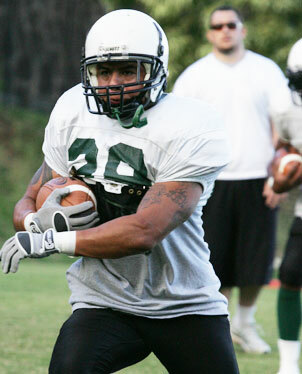 Hawaii running back Camron Carmona is known for his willingness to make contact. When every repetition counts toward a chance at some playing time, selective hearing can be an asset. Senior running back Camron Carmona, all of 5-foot-8 and 170 pounds, has earned a reputation as one of the scrappiest Warriors. Sometimes, knowing when to quit on a play takes a backseat to his desire to improve his standing in the Hawaii backfield. He isn't listed among the top few backs in the depth chart, something he hopes to change through sheer effort. "I'm excited. It's going to have its ups and downs, but you gotta keep fighting the good fight," said Carmona, a high school teammate of Colt Brennan's at Mater Dei in Santa Ana, Calif. "It's always nice to get out and bang. It's fun to compete. I think that's what drives a lot of these guys. A lot of the chances you get is when it comes with contact. While we're just doing drills, it's techniques and stuff like that, but when 11 and 11 line up, it's time to go." Carmona, a walk-on transfer from Fullerton (Calif.) Junior College last year, considers himself a fiery player. He doesn't back down from anybody -- even linemen nearly double his weight. Before the Warriors' first scrimmage of the spring last week, Carmona and defensive tackle Vaughn Meatoga grappled to the ground at the end of a physical blocking drill, well after the coaches called out the end of the play. Meatoga tried to kick the pesky Carmona in the heat of the moment, causing the coaches to yell at the lineman to get off the field. When Meatoga got to the gate of the UH grass practice field, he was called back and allowed to stay. After practice, it was something both players could share a laugh about. They're actually pretty good friends who've been in classes together on campus. "But I mean, it's all good fun -- stuff like that happens all the time. Emotions and adrenaline starts pumping, and that kind of stuff happens. Kind of part of the game -- some would say no, but it really is." It wasn't the first time Carmona mixed it up with a teammate. A couple of days earlier that week, Carmona got into it a bit with fellow running back Jake Heun -- but he said they're also on good terms. As far as new running backs coach Alex Gerke is concerned, the occasional extracurricular activity shows him that the players are passionate about their jobs. "Camron's got a little personality to him ... I tell you what, I think everybody needs to have it," said Gerke, who cited burst and heart as Carmona's top assets. "I don't care what position you play. You need to have a little personality to play this game. ... I think it should be that way every day." Last fall, Carmona and linebacker Tyson Kafentzis scuffled during a kickoff coverage drill. It resulted in a two-game suspension for Kafentzis, who now considers Carmona a kindred spirit on the other side of the ball. They both go to New Hope Diamond Head church on a regular basis. "We're good. Camron's a good guy, man," Kafentzis said. "He works real hard and he's kind of like me but he's a running back. We just butted heads. It's just a physical sport and sometimes it gets crazy. That one got a little out of hand, but as soon as practice was over, it was over. I never carry anything off the field." Junior running back Jayson Rego hangs out often with Carmona away from football, and sees a transformation occur whenever the pads are strapped on or off. "Overall, Cam's a good kid," Rego said. "He's a pretty laid-back guy, but when it's time to do work, it's time to do work." He has not taken a handoff yet during a game, but Carmona, a health and science major, is getting comfortable in Hawaii. He married his wife, Vanessa, in January, 10 days after the Warriors' Sugar Bowl loss to Georgia. One of his biggest concerns off the field is reclaiming a set of golf clubs he left at the apartment he and Brennan shared. "We gotta get together on that, because I'm missing my golf practice," he said, adding a smile.